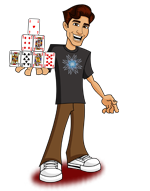 Today, when you order "Hook by Andrew Mayne", you'll instantly be emailed a Penguin Magic gift certificate. You can spend it on anything you like at Penguin, just like cash. Just complete your order as normal, and within seconds you'll get an email with your gift certificate. Phase 1: Demonstrate your ability to control pain by piercing a fish hook through your skin. Phase 2: Display your uncanny ability to control your blood flow by moving the hook around without a single drop of blood. Phase 3: Rip the fish hook from you flesh and appear to heal instantaneously in a supernatural manner. ...All of this takes place while the spectator holds on to one end of the hook. 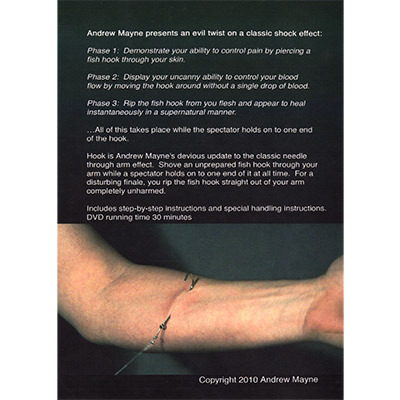 Hook is Andrew Mayne's devious update to the classic needle through arm effect. Shove an unprepared fish hook through your arm while a spectator holds on to one end of it at all time. For a disturbing finale, you rip the fish hook straight out of your arm completely unharmed. Includes step-by-step instructions and special handling instructions. NOTE: Large fish hook not included. A reason i took away the star was because of the fact that you pay around ten dollars for a DVD. Since it does not provide the hook and string i would rather it be a download and possibly nock off 2-3 dollars. I would actually prefer it to be in a DVD but come with the hook and string. 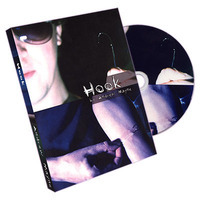 The trick itself is great and it really looks like the hook is going through your skin! Andrew has come up with another winner. It's fairly easy to do, and you end clean. Some may disagree with the 5 because he's modified the Needle Through Arm illusion, but you've got to give him credit for his creativity and ingenuity.